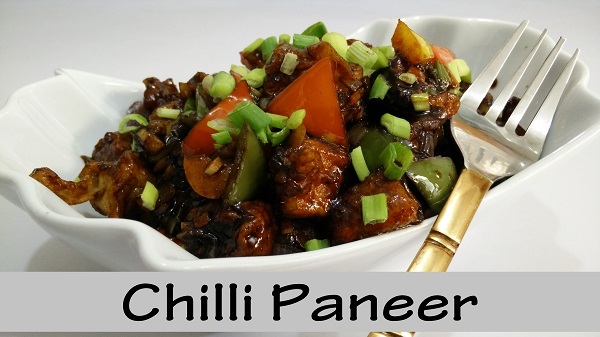 Chilli Paneer Recipe – One of my favourite Indo-Chinese food is a delicious mix of flavours from Chinese and Indian cuisine. Cubes of Paneer cooked in a spicy gravy. It is very easy to prepare at home. Take Paneer Cubes in a bowl, add Ginger Garlic Paste, Black Pepper Powder, Salt. Mix well and keep it aside for 5 – 7 minutes. Take another bowl, add Corn Flour, All Purpose Flour, some Salt, one tsp Oil and mix well. Add some water and make a paste. Heat Oil over medium to high flame. Coat Paneer cubes one by one in Corn Flour paste and deep fry till it turns golden brown in colour. Heat 2 tbsp Oil in pan and heat over high flame. Add Garlic, Ginger, Green Chillies and sauté for 30 seconds. Add Spring Onion White, MSG, Capsicum, Tomato Sauce, Chilli Sauce, Soy Sauce, Sugar and mix well all ingredients. You can also add some Vinegar (optional). Add some Salt, Black Pepper Powder and mix well. When gravy starts boiling, add fried Paneer Cubes and mix well. Add Spring Onion Green, mix well and switch off Gas.